Hello there lovelies! It is Shay here (Winnie is curled up in her chair in the studio helping out in her own special way) with a simple and easy Mother's Day card I made for my purple loving grandma. 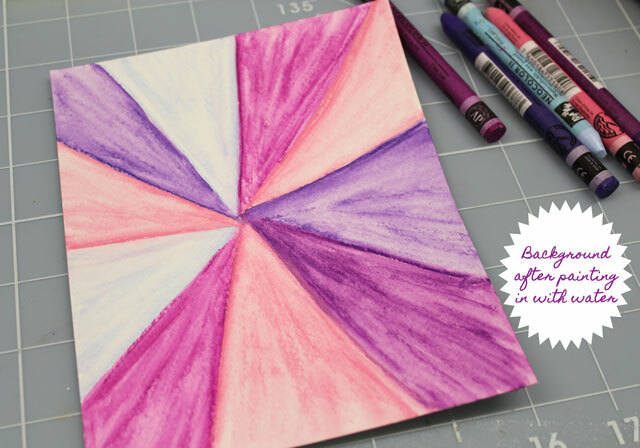 If purple doesn't suit you or for the person you are sending a card it is very easy to change up the color palette. 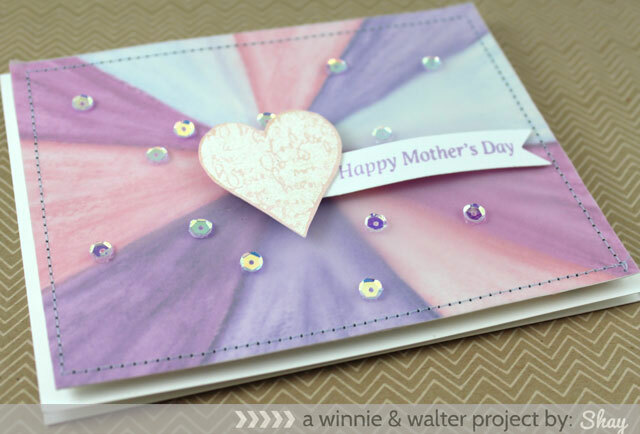 Another way to customize this simple card is to create a different design other than a burst. I began by watercoloring a background on watercolor paper using some Caran d'Ache Neocolor II water-soluble wax pastels in purples, a pale blue and pink. 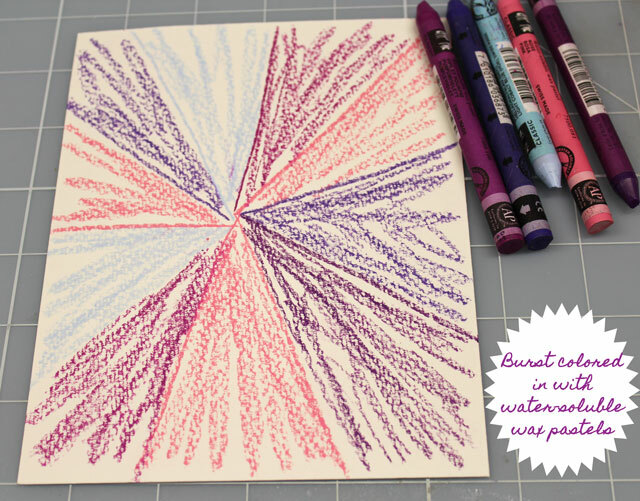 I colored in the burst design--this is another way to alter how the image appears as you could color in a circular motion, horizontally, diagonally or some other direction. Watercolor paints of your choice would work equally well here. With a water brush I painted in the burst. I then sewed on a layer of vellum over the watercolor panel. This was all attached to a white card base with foam dimensional adhesive. I white embossed a script heart from You've Got Love Mail and watercolored it in and sprayed it with shimmery sprays (this was actually sitting on my worktable waiting to be used). I attached the heart to a banner cut with a Papertrey Ink die and stamped with the sentiment from Parentville in soft purple Hero Arts Shadow Ink. Last I added some pretty sequins. This card was quite fast to make and it is full of pretty purples which I hope my grandma will appreciate. 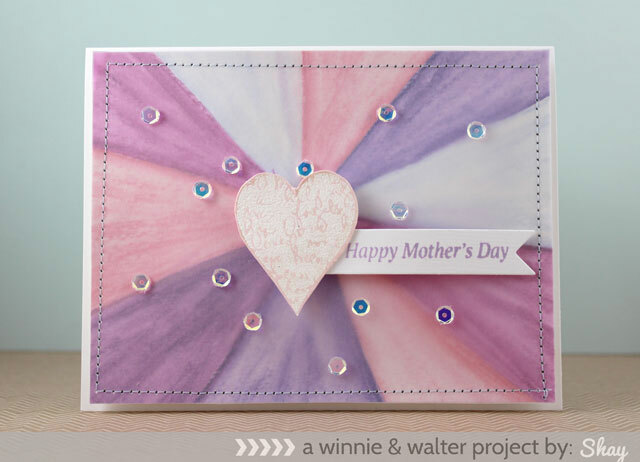 We would love to see any Mother's Day projects you make using w&w products. Simply link up on our join in to win! page and as a bonus you will be entered to win a coupon code good for a stamp set of your choice! Love the vellum over your burst! Looks lovely! Gorgeous! Love the water colored burst and the vellum over top is perfect!! <3 Emily L.
Love it! That vellum really added 3rd dimension I think.. thanks for sharing, Shay! This is really pretty, love the burst design! Fabulous! The vellum makes it look like gathered sheer fabric. Cool technique. I like how the vellum softens the burst.